It was so refreshing to scroll through social media networks yesterday and see all the love for fathers. With so much craziness going on in the world, I think we are all starving for a celebration of love. Personally, this year was the first year in a long while that I was able to drive 20 minutes down the road to see my dad on Father's Day, and I am so thankful for it! I started to think about the lessons that I've learned from my dad that carry over into my career in design. 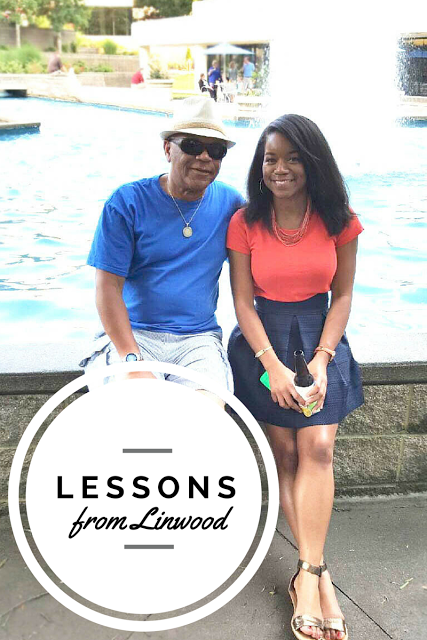 Some of these lessons he instilled in me purposely, while others I gleaned from his example. HAVE FUN Linwood prioritizes having fun in life. He loves to cook and entertain, ride his motorcycle and hang out with his friends and family. I'm not as good as he is at making time to just have fun, but have realized that it truly does increase my productivity. If I don't take a break to laugh, enjoy some good food and people that I love, my work becomes dull. DIVERSIFY Even though my dad has been working in healthcare for half of his life, he also created businesses for himself outside of his formal education. He's previously owned several businesses all while maintaining his specialty in radiologic technology. His entrepreneurial spirit has made me think about how I can expand my design services to help more people in various ways. KNOW YOUR SKILLS Spend more than an hour around my dad, and I can guarantee that he will tell you that he has 756 skills. What exactly are all these skills? I'm not sure and I don't think anyone really is. The point is, HE knows. He knows what he's great at and what he's not so great at. (Most of the time) he sticks to what he does well so he's more beneficial to others. When I'm designing, I stick to what I'm great at and rely on a team of experts in areas I'm weak in to support my vision. VALUE YOUR OWN CREATIVITY I admire my dad's confidence in his own ideas and vision. When he comes up with something, he doesn't hesitate to share it and believes that people will love it. So many times as a creative we are our own worst critic. There have been so many great ideas that never came to fruition because they were cut from a vision before they were given a chance. Whenever I start to question whether my idea is "good enough" - I think of Linwood and at least take a second look! WORK HARD(ER) No professional can succeed without giving 110% to what they do. Growing up, my father taught me that nothing worth having comes easy and pushed me to keep going. Quitting was never an option, and being tired was not an excuse. I appreciate my dad teaching me this at a very young age, because it's definitely got me through when I felt like giving up. What has your father taught you that helps you in your career? I hope y'all have a great Monday!